If you view camping as a chance to get off the grid, then read on. If you want to get back to nature and really use the natural world around you on your next camping trip, see our tips below. Heck, if you just want to save a few bucks and book a non-powered camping site and use our free solar energy on your next holiday, we have a few ideas for you. Well, first and foremost, you will want to light up your campsite at night and for any walks around camp and what not. However, if you’re just bringing your tents and a car and don’t have a big RV to pull up to your site, then you might be looking for other options. What about instead of plugging in everything — you instead light up your campsite with the solar power you collected during the day? There are lots of great lights and lanterns out there that will light up your campsite easily from solar power. And bonus, some of them will also charge your devices too! You can get some more ideas for lighting when looking at our glamping post about using solar powered fairy lights to make your tent look cool! OK, so you went ahead and booked the non-powered campsite. You really are going to stay off the grid for this holiday. Unfortunately, your boss still demands that he can at least email you if an emergency happens. Or perhaps you know you and your kids aren’t going to be together every second of the holiday, and you’ll need be able to text each other. Well, that will mean recharging devices to use throughout the holiday. But you don’t have to give in and use even more technology and power — instead you can turn to a handy solar-charged recharging gadget. While you hike around during the day, you can charge up a device that will then power up your phone at night. Read through our post on cool solar-powered gadgets, as quite a few are excellent ways to “naturally” charge up your devices. Byron Beach station – adjacent to the Shirley Street level crossing in Byron Bay township between the First Sun Caravan Park and Simmos Caltex Service Station. Just because you’re going off grid on your camping holiday doesn’t mean you can’t have good food and be a little fancy. You can still bring along good food (with perhaps a little prep at home) and plan to cook some excellent meals at your campsite. But that doesn’t mean you have to plug in anything — you can use something cool like this solar powered camp stove from GoSun. This cool camping stove allows you to cook a meal in 20 minutes by using solar energy. It packs up easily so you can even take it on hikes and have a hot meal while you’re out and about! And finally, the great thing about solar energy is that it’s portable. You can take it with you wherever you go. Not only does that mean bringing along portable solar panels that you can use at camp, but also you can bring along solar panels that might strap to your backpack. Click on this link to get some ideas of what you might want to purchase. 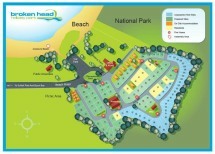 Book your non-powered campsite or any other accommodation at Broken Head Holiday Park now to start dreaming about your quiet, off-the-grid (or at least mostly) holiday. We are very eco friendly here at Broken Head, and we can help you utilise the solar energy for your needs from charging cell phones, to lighting up the camp site. We get a lot of sunny days here in Bryon Bay so we’re ready to power you up for a great holiday!